How can we max out our surf fitness and ensure we’re still able to catch waves well into our old age? It’s a great paradox we may never fully know the answer to. One thing’s for sure though – our joint mobility plays a big role. The truth is, if you’re unable to get into safe positions on the board due to mobility restrictions or imbalances, not only does your risk of pesky injuries go up, but your performance in the water can suffer as your progress stalls. The great news is that the opposite is also true. 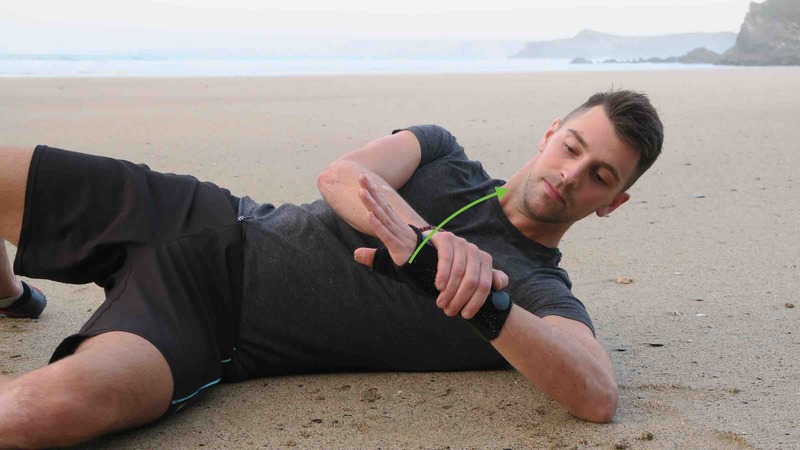 Just 10-15 minutes a day spent on specific stretches, release exercises and stability drills can do wonders for your mobility and overall surf game – now and long into the future. Fewer injuries, more time in the water, faster skill development and a lengthier surf career – all sounds good to me! Let’s duck-dive into five of my favorites. Ah the thoracic spine… This area of the mid-back (and the surrounding ribcage) is a common sticking point for many a surfer, particularly beginners and intermediate riders. Sitting for hours in the van, hunching over iPhones and general 21st-century life can create a whole load of stiffness. When we’re then trying to paddle out past the break, that tighness makes it harder to extend through the T-spine and get into an effective, upright paddling position. This places excess strain on the neck as it cranes up. 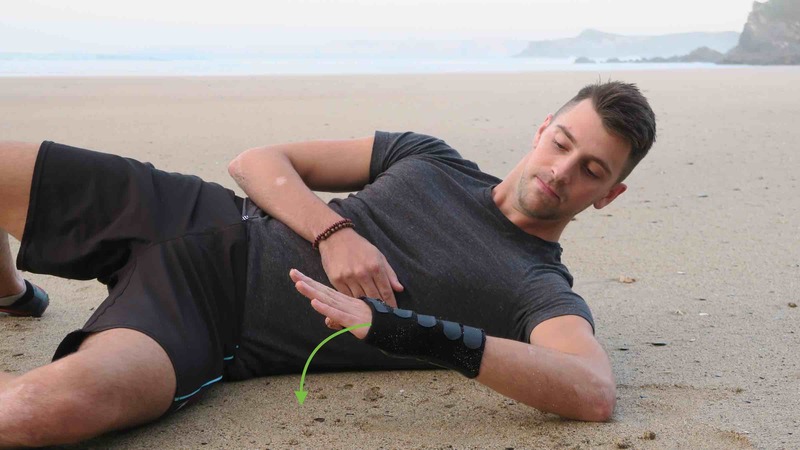 It also restricts the shoulder blades and limits your ability to reach out overhead (which can potentially lead to some funky shoulder issues). Grab your trusty foam roller (a rolled up towel wrapped around some pipe can also work, as can two tennis balls taped together). 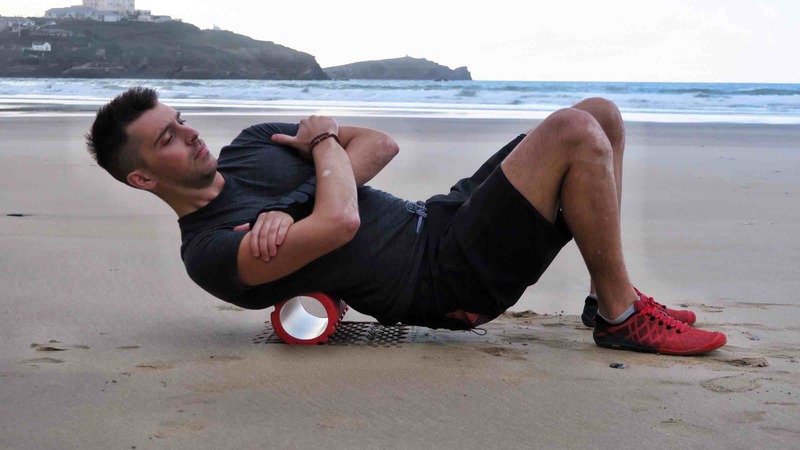 Lay on your back, starting with the roller at the bottom of the ribcage, perpendicular to your body. Position 1: With your arms across your chest, spend 20-30 seconds gently rocking your body from side to side to free up tension either side of the spine. Repeat the same process, moving up one segment of the spine at a time until you get to the base of your neck (aim to hit 5-7 separate segments on the way). If you find a gnarly spot that makes your eyes water, don’t skip ahead and pretend it didn’t happen. Back off a little, breathe into it and hang out until the sensation dissipates before moving on. Feel free to repeat the same sequence laying slightly on your side (at around 45 degrees to the floor) to hit the ribs and the matted down connective tissues on your side body. The lunge and twist is one of my all-time favorite surf-specific mobility exercises for a whole host of reasons. First up, it addresses one of the most common complaints and postural issues we see in surfers – lower back pain. When you combine the slight bend at the hips in a surf stance with a bunch of sitting out of the water, the hip flexors get chronically tight, rotating the pelvis and causing stiffness in the old lumbar spine. The lunge is one of the best ways to open those bad boys up. The twist is the icing on the cake, wringing out spinal tension like a sponge. That mid-back we touched on above is often limited in rotation, as is the neck. This makes it harder to turn your board efficiently and execute those sick cutbacks. The result is that the lower back often takes up the slack, which can again result in issues. Get down on all fours and step your left foot up to the inside of your left hand. You can keep your rear knee down, or elevate it for more of a challenge. If you choose to elevate, remember to keep your right glute as contracted as possible throughout to protect the low back. 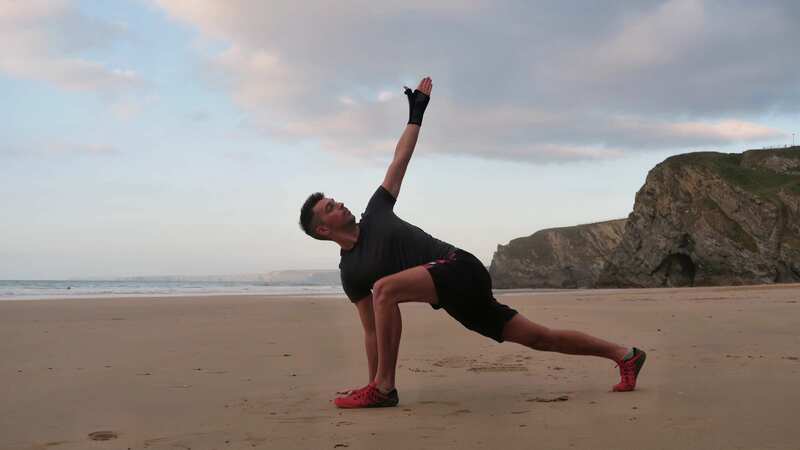 Keeping the core tight, lift your left hand off the floor and begin to rotate your upper body to the left, initiating the turn through the mid back, followed by the neck if comfortable, and then finally reaching the left arm up high. Try to prevent the supporting arm (your right) from collapsing in and internally rotating at the shoulder. To do this, think about screwing your right hand into the floor, away from your body. When you reach your end range at the top of the position, take a deep breathe through the nose, attempting to fill your ribcage with air. As you slowly exhale, see if you can pick up the slack and gently move a little deeper into the position. Repeat for 5-8 breaths, then do the same on the opposite side. Paddling out past the break or to catch your wave requires a good degree of shoulder mobility, particularly internal rotation (and a degree of external rotation too). If you stretch your arms out to your side with the palms facing forwards and a 90-degree bend in the elbows, internal rotation sends the palms towards the floor, whereas external is the opposite. If you’re unable to fully internally rotate, the shoulder is in a much less stable position when you paddle, resulting in a less efficient technique. Simply put, paddling becomes more effort than it needs to be, and it’s harder to catch waves. On top of that, those thousands of strokes in a sketchy position add up and can potentially result in shoulder impingement and rotator cuff injuries. Lay on your left side with your knees bent and your chest facing at a 45-degree angle to the sky. You can support your neck with a pillow if required, but try not to fall asleep. With your left elbow bent at a 90-degree angle, grab your left wrist with your right. Position 1: Keeping your left shoulder pinned to the floor (super important) use your right hand to gently guide your left forearm towards the ground until you feel a stretch. When you hit your end range, hang out there for 40-60 seconds, breathing normally. Position 2: Next, you’re going to take a big breath in, and as you hold that breath for 5-10 seconds, push your left arm against your right in the opposite direction (externally, away from the floor) but resist the motion with your right hand (so nothing actually moves). Position 3: As you breathe out, gently ease off the tension. You’re then going to release the right hand from your left and use the strength of your left arm on its own to guide the arm towards the floor, internally rotating. Hold this contraction for 5-10 seconds. Take a pause back in Position 1, then when you’re ready repeat Positions 2 & 3 a couple more times, before doing the same on the opposite side. If you notice that you’re restricted more on one side than the other, you may want to spend a little more time working the weaker side. When we’re able to move freely through the hips, pretty much every physical activity we do becomes easier, less restricted, and subsequently more enjoyable. Mobile hips mean a faster, smoother popup on your board – essential for timing your wave properly. 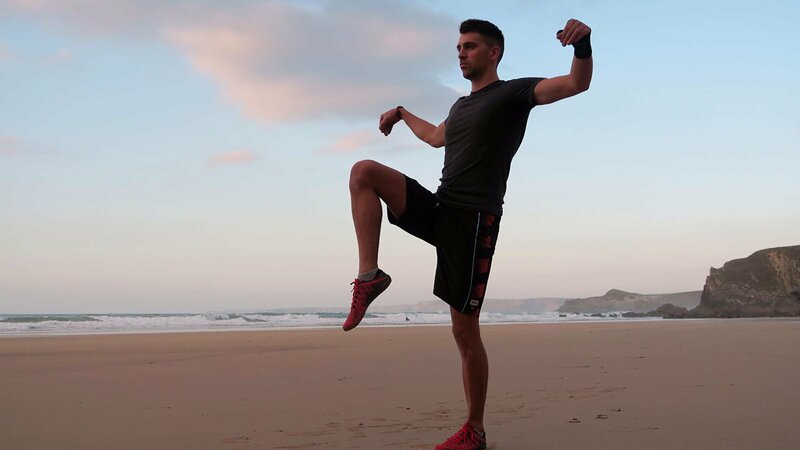 The squat sequence we’re going to explore below (inspired by Ido Portal) can also help with knee stability, ankle health, and even more thoracic rotation. All key attributes needed for maintaining balance and keeping control over your stick, whilst reducing your risk of getting hurt. Position 1: We’re going to start by freeing things up, internally and externally rotating at the hips. Support your upper body with your hands or elbows on the floor behind you. Staying on the balls of your feet, slowly externally rotate your left leg to end range (moving the knee away from the body), followed by internal rotation (left knee towards the right). Perform 15-20 reps, then repeat on your right. Position 2: With your core switched on, lower into a deep squat. Ideally, we’re looking for the heels flat, arches lifted, feet screwed into the floor (facing forwards or turned slightly out), and the spine nice and long. We’re all different, so if you need to turn your feet out, hold onto a wall or put some blocks or bricks under your heels to get comfortable for now, that’s cool! Find a position you can rest in for 60-90 seconds. With your hands on the floor, slowly start to shift your weight around, exploring tight spots and loosening things up. Position 3: If you’re struggling with Position 2, that’s no problem. Stay there for now, or take this one super gently. In the deep squat, we’re going to grasp the right shin with the left hand, then staying tall, rotate the upper body rightwards towards the sky. Like we did in the lunge twist, initiate it through the core, mid-back, then neck if comfortable, and finally reaching overhead with the right arm. Return to center, repeat for 15-20 reps, the do the same on the opposite side. It’s no secret that your knees take a bit of a battering if you surf on the regular. There’s a ton of force at play when you’re turning, particularly on the back leg (which is prone to collapsing inwards and causing all sorts of trouble). When done regularly, the hip sequence above is a great way to protect your knees from injury. Freeing up the hips allows you to externally and internally rotate without restrictions, meaning your knees don’t take the brunt of it when you smash that bottom turn. The balance drill below is another great one to add to your arsenal though, as it can really help with both knee and ankle stability. Position 1: Stand tall with your bum clenched and your core tight. Find a fixed point on the horizon and gradually lift your left leg off the floor, bringing your knee past ninety if possible. If this is a challenge, lower the leg slightly and over time try to build up to 60 seconds of balancing. Position 2: Keeping your core on, you’re going to slowly reach your left leg out to the different points of a compass, very gently touching down or near to the floor. Allow your standing leg to bend as necessary, but focus your efforts on preventing the ankle and knee from collapsing inward. Hit North in front of you, North West, West, and all the way around the back of your body to North East (which should be a challenge). The closer to your body the point of contact with the floor, the easier it is, so try to widen your circle as much as possible. Repeat for 3-5 circles (forwards and back is one), then swap sides. How can you structure all of this onto your training? Like many things in life, with mobility there’s no one-size-fits-all approach. The most important thing is to find a schedule that works for you. That might mean 10-15 minutes of the above every morning before work. It might be a case of including the drills into your pre-surf warmup, or into any home training or gym work you like doing. However you choose to incorporate your mobility work, remember that it’s consistency that counts. By committing to the process on a daily or near daily basis, over time you’ll start to see tangible improvements in both your surfing and everyday physical activities.